I am slowly but surely getting Kiahs room and her decor all wrapped up! 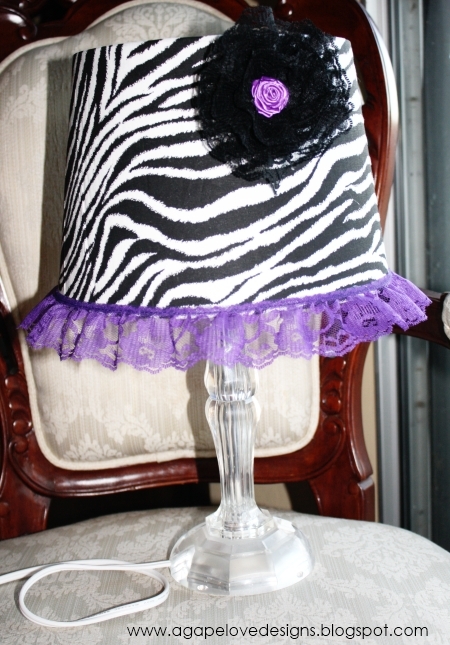 her zebra print curtains and sheer purple curtains. I have decoupaged her light switch and outlet covers. 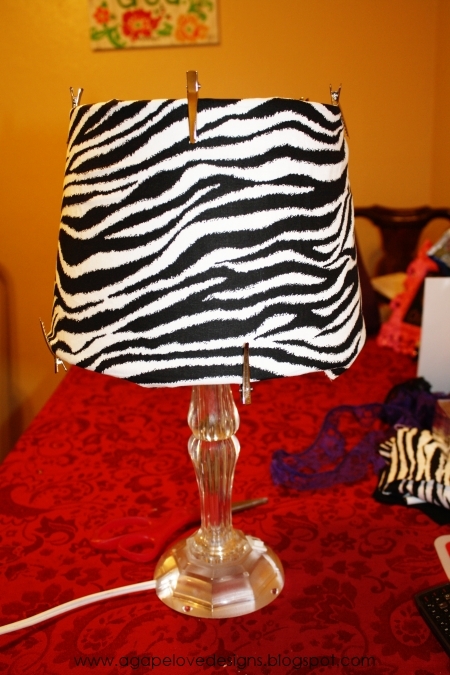 this one of a kind zebra print lamp shade for her! We already had this lamp base, it was from her old lamp. 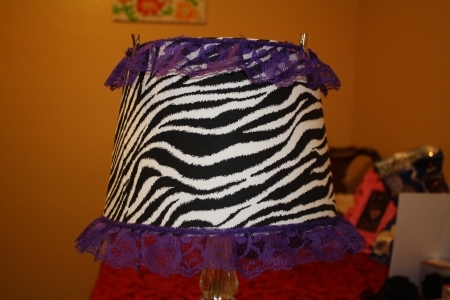 new pretty lamp shade to go with her room! 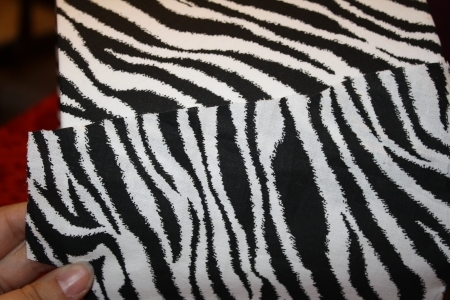 Remember the fabric I got for $1 that I used for the light switch covers? Well I still had plenty left, and laid it down flat on the table. When I was done, I had a curved rectangle shape. 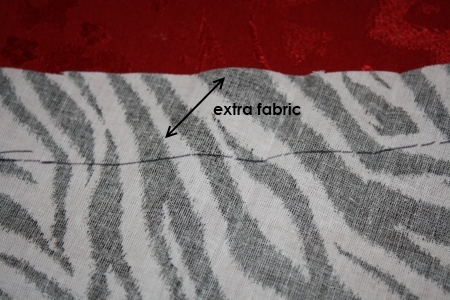 I cut it out leaving about an inch extra fabric from the pen line. This way I could fold it over and glue in place. 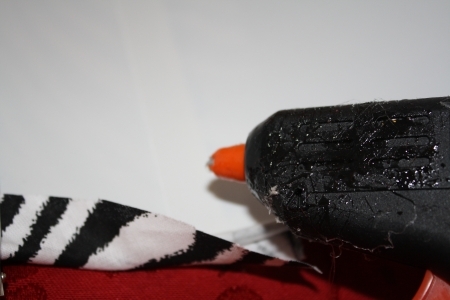 to keep it in place as I went before I glued anything down. at the crease here. 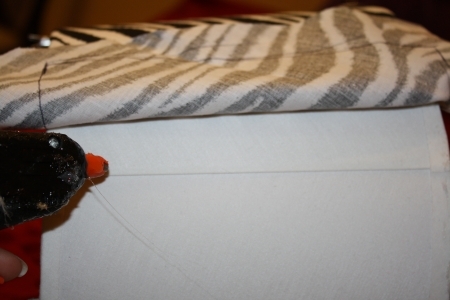 and Firmly pressed the fabric down. 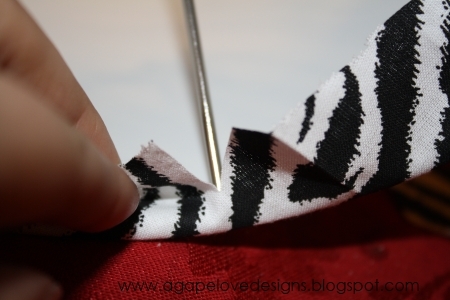 fold and glue it over. it down around the underside of the metal! 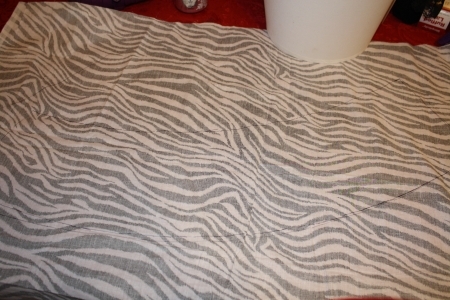 so I could fold it over and made a nice neat line. And that part is done! And looking great. 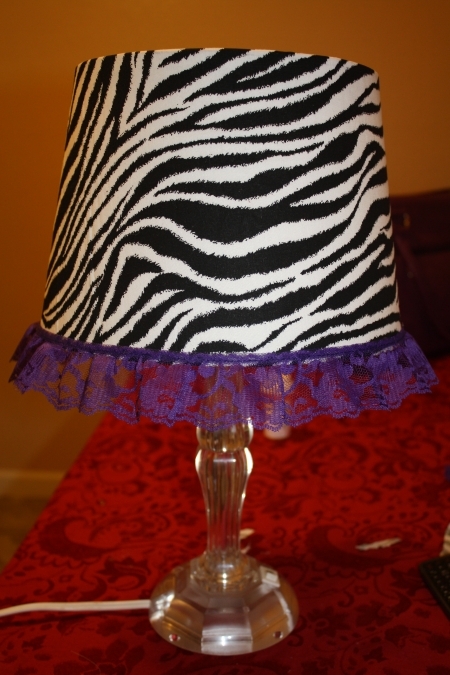 Next step, purple trim lace glued around the bottom of the lamp shade. 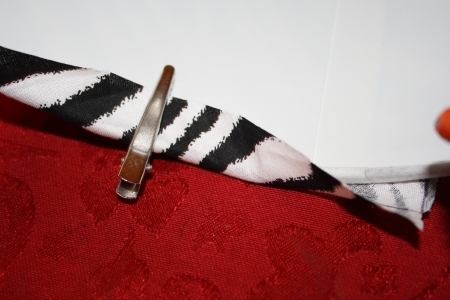 so I used the alligator clips again to get a good look. I looked cute, but I just wasnt for sure.. so I decided to do something else. 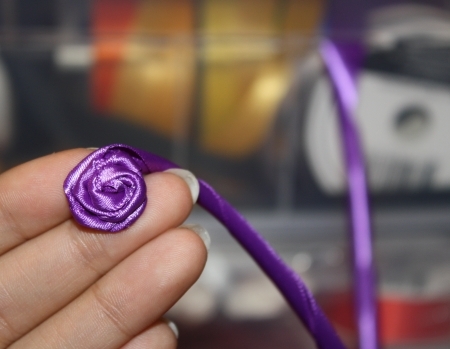 I started making a little silk ribbon rosette. 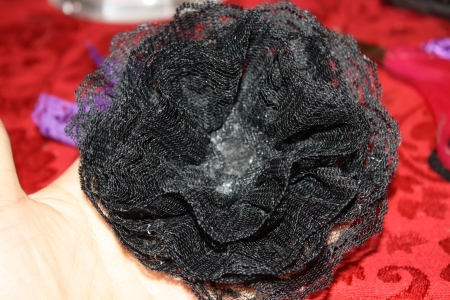 Then made a lace flower using black lace trim. 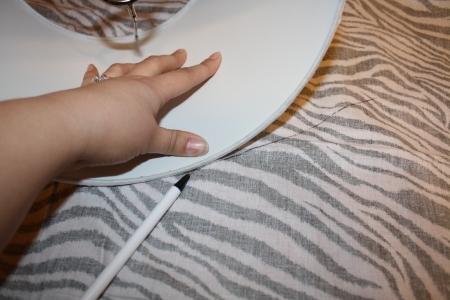 then glued the flower the top of the lamp shade. Here it is in better lighting. I LOVE how it turned out! Kiah was beyond excited about it too! I love the mixture of the print and the lace, it looks even better in person. Check out the linky partys I like to join! that turned out soooo cute and it looks so easy to make. I can totally see myself making one for my mother's room for mother's day, she needs a lamp and I can jazz up her room with one. 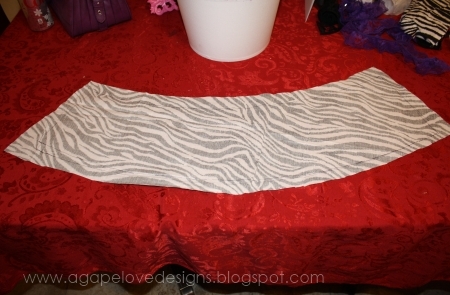 I plan on doing my girls room in zebra print and pink. 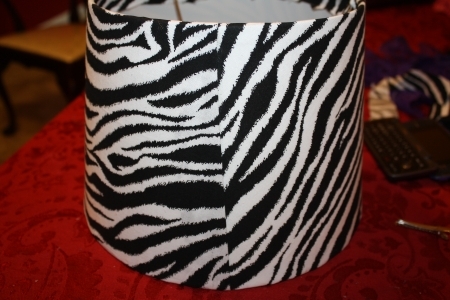 I told my husband I wanted to paint their walls a dark pink, have white furniture, and throw in zebra print accents. Let's just say his eyebrows went REALLY high! 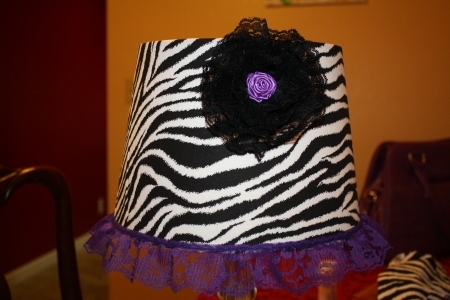 That is so cute, my older sister loves zebra stripes and would absolutely love that lamp.. 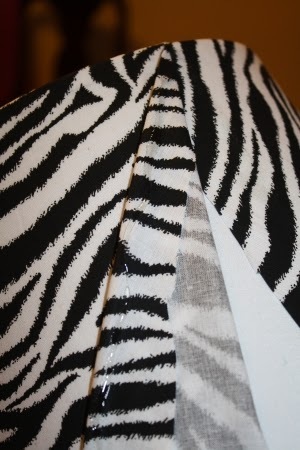 I did a zebra stripe project this week as well, check it out if you want. 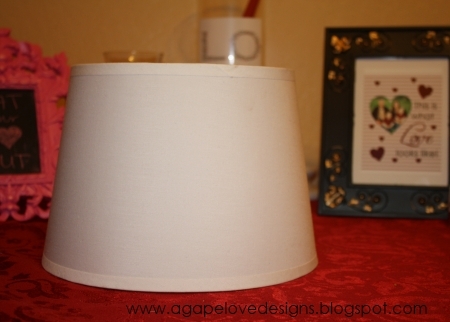 Your lampshade is so cute! 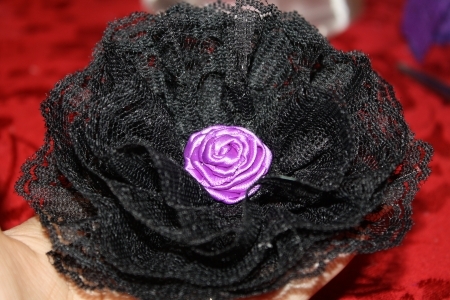 I especially love the rosette! Love it! I told my husband I wanted to do something similar and he said NO. 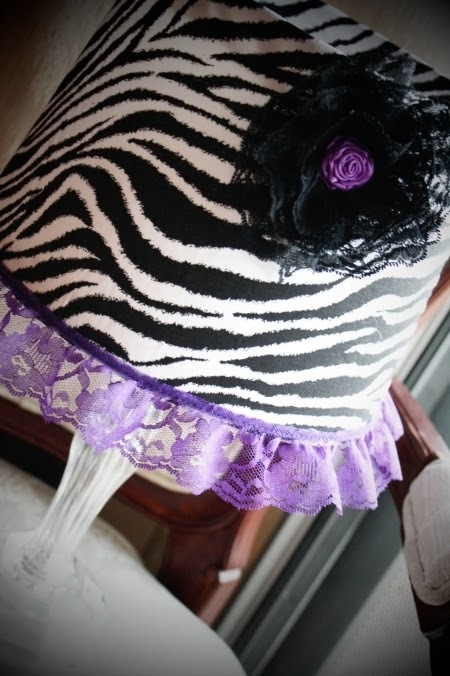 For some reason he thinks that adding fabric to a fabric lampshade turns it into a fire hazard. SO fun!! 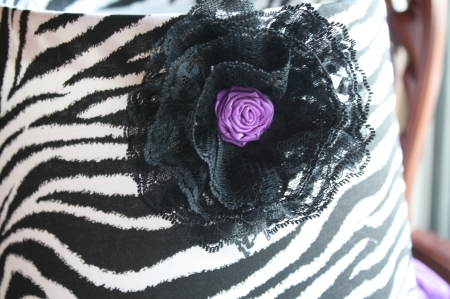 I love the purple! Great tutorial! Hey Maria, YUP you saw the feature before I could tell you, lol. Sorry, I was swamped when I posted those, and barely could get them done, and then I just didn't get a chance to let everyone know, lol. You found out anyway, he he, cuz you love me, and check out my blog anyway, he he. Thanks for linking up to Bella Before and After **AMAZE ME AUGUST** party, I LOVE having you. That looks really chic! The transformation is really amazing transformation. It gives your room a new personality.